As an industry, digital marketing is experiencing a major transformation. Every aspect of the industry is being tied back to data. Data is everywhere. It’s the backbone of every marketing campaign allowing agencies and companies to make informed decisions about their marketing efforts. Digital tactics that worked in the past are now be re-envisioned to offer a seamless and consistent brand narrative across all digital channels. Brands that expect to serve and engage their community, need to incorporate new strategies for the upcoming year. It’s no secret that companies are investing more in digital marketing efforts. In fact, according to recent predictions, 2015 will be the year that digital surpasses traditional marketing efforts for the first time. With 2015 quickly approaching, it’s not too late to incorporating these five digital marketing trends for the coming year. The number one secret for this year, will be for companies and agencies to promote their value-added content. 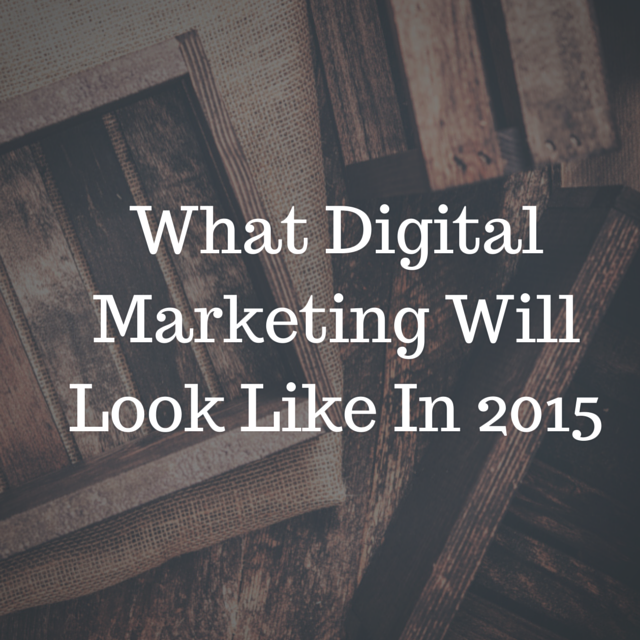 Yes, it sounds obvious that this should be the number one digital marketing prediction for 2015. Content and context will continue to serve as the flagship of any successful digital marketing campaign. Google is still working on bridging the gap between content and context and it will take them some time to catch up. Together with value-driven content, brands should be investing in longer tail, and in-depth content. The longer content pieces enable companies to enhance their position within their respective industry and increase search potential. Along with quality content comes cross-channel promotion. Paid promotion (search and social) will continue to take a leading role in a brand’s effort to take a position within a niche industry. Educating target markets will become the driving force for many brands. While content has always been a critical force in marketing, 2015 will focus on search engines working tirelessly to deepen the relationship with users on their properties. This effort means that brand visibility will require paid promotions. Companies and brands will have to invest more resources to promote their site and products by increasing their social listening, even on less brand centered sites, like review sites or secondary properties. Technology in 2015 will continue to blur the existing lines between marketing and IT. With content marketing driving the digital space, communication between IT and marketing needs to be optimized. Unfortunately, the two teams don’t often share a common vision and that is often the challenge. In 2015, the two sides will need to cast away their differences to create a shared mission, one that provides the most value to the company. Collaboration of this level represents a shift in how marketing is handled in most companies but it will be a necessary change for overall success. With tech and digital becoming more related, communication among the teams will determine the company’s growth. In the past, many spoke of the silos of content, search and social. This separation was never destined to remain. In 2015, this will become very clear. Marketing this year will turn into a unifying aspect of organizational growth, empowering every team player to assume the role of brand manager. In short, 2015 will be the year of 1:1 scaling of customer journeys. Digital marketing has been slow in integrating cross platform marketing efforts. This year, brands will leverage the social listening tools and datasets to gain much more insight, with the help of more sophisticated analytic and tracking software. Together, these metrics will track the unique journey of each customer along the conversion funnel. Especially with the rich micro data provided by the social media platforms, brands should use this year to connect the dots and follow the digital conversion trail. Digital marketers aware of the importance of social, will reaportion their marketing efforts to social selling and social listening. Each year, consumers are spending more time online. Now, marketing efforts will continue to capitalize on this trend by erasing the online/offline barrier. While cross platform marketing will take the lead in 2015, rich engagement of this nature only works if brands can create content native to each platform, while still weaving a consistent brand narrative across digital channels. Each brand will need to learn to respect the norms and nuances of the platform. Mobile usage trends are amazing. Clearly, the surge will directly impact on the marketing efforts in 2015. Marketing as a whole will be forced to push the envelope in terms of creativity and simplicity as consumers revise their mobile consumption preferences. This year will be the year of cross mobile device marketing. Clearly, the growing trend of wearables will also turn into a territory that is waiting to be integrated into marketing efforts. Together, these two trends are creating a new reality for marketing- a reality that is hyper focused around data and simplicity. Conversion funnels need to be simple, optimized, and seamless across multiple mobile screens. With the growth of mobile/ wearable devices, marketing teams will incorporate some of the few mobile metric tracking software to establish a primary position in the growing market. The rich mobile data will provide marketing teams with the insight of consumer behaviors allowing these mobile patterns to support and influene online/ offline conversion efforts. The brands and companies able to merge data into tangible marketing efforts, will dominae the new mobile/wearable trend. In 2014, everyone was focusing on Big Data. In 2015, Big Data will become a critical influencer in driving marketing efforts. 2015 will be the year when marketers, across all sectors- B2B and B2C- will embark in communicating to targeted consumers on an extremely granular level. This will be the year the marketing data from all of the digital conversations finally drives the efforts of marketing teams. Transforming data into measurable results with a focus on conversions, not traffic, will be the slogan for 2015. Marketing to the masses is a strategy from the past. Now, it’s time for companies to finally invest in customizing content and personalizing marketing tactics to niche markets that offer the highest yield of profitability. Creating personal experiences will mean a need to distill messaging to create a 1:1 illusion of content. Obviously this style of investment may seem daunting, the benefits of crafting content that is relevant, engaging and personal, will clearly impact the bottom line of any marketing team.